The Stella Steel 29er is equally at home racing your local singletrack or decked out with bikepacking gear for backcountry adventure. Available in Standard or Boost 29er/27plus spacing. All our Stella Steel’s are Made in USA. Our proven design hits the mark for those seeking more tire and mud clearance, drivetrain compatibility and durability. The newest URSA 29plus, available now takes advantage of the latest hub & wheel standards, now utilizing 148x12 Boost rear hub spacing with a 73mm threaded bottom bracket while offering the same great tire and chain clearance as the original URSA 29plus! The CHUMBA URSA 29plus led the way as one of the first production plus bikes on the market. 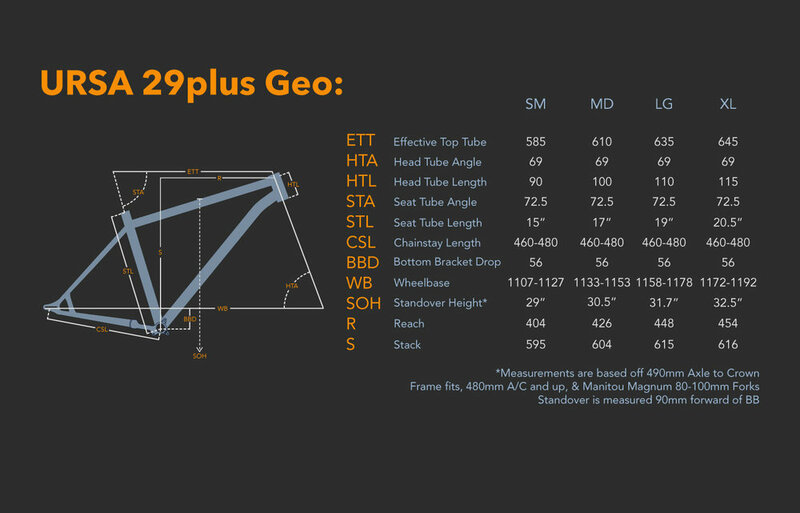 Traditionally, 29plus is a wheel size that used 3.0" tires. Now riders are using anything from 2.6-3.25" wide tires. These tire sizes yield tons of fun, traction in the best and worst conditions and a smoother ride. The extra cushion of the wider tires means you can ride this bike more aggressively and go farther. A plus bike's larger tires also allow for extremely low tire pressures usually between 8 and 20 psi. Riding on a plus bike tire you can lean the bike much harder into turns allowing you to maneuver quickly on the trail. Backcountry bikepacking, plus bike racing, trail riding, rocks, sand, & snow: The URSA 29plus has you covered. Loaded up to survive or built out for the trail, this bike puts a smile on your face. The URSA 29plus frame offers incredible versatility and industry leading drivetrain and tire clearance! All in a Boost 148x12 frame with a simple 73mm BSA BB. 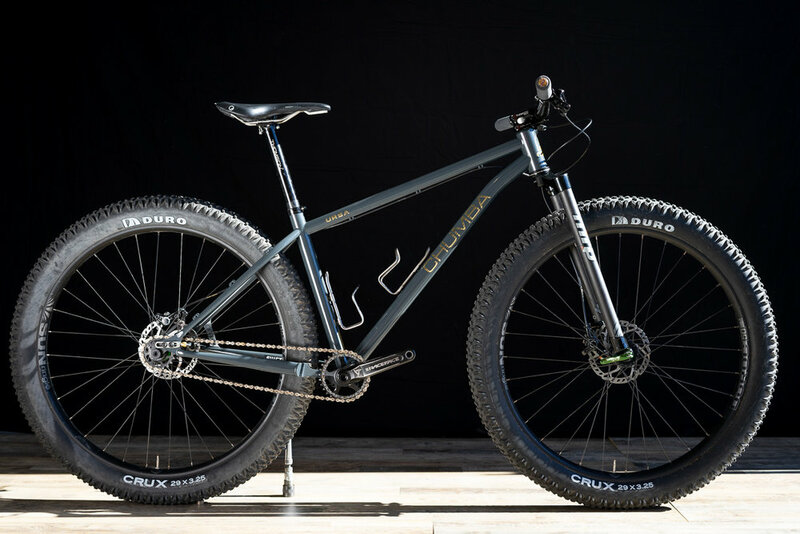 The ultimate all terrain bikepacking rig, the URSA 29plus Backcountry edition is ready for nearly any trail condition you can encounter on your next adventure. 29plus tires save fatigue on your body during long bikepacking days in the saddle. The URSA offers a stable ride while loaded down that can still deliver big fun on the trail!